Most readers here are aware of the Skripal case, and the use of that case by the West as a crisis of opportunity to expel Russian diplomats and spies in retaliation for what they are saying is an attempt to assassinate a treasonous mole within Russia's intelligence networks. What has astonished me personally is the nearly unanimous behavior of the Western powers, beginning with Great Britain and ultimately involving the USA, France, Germany, and so on, in similar expulsions in retaliation for Mr. Putin's alleged perfidy in trying to assassinate Skripal. My problem, from the start, has been the utter lack of real evidence that Russia would do this, and the utter lack of a motive for it to do so. Skripal served time in Russian jails, and became a part of a "spy swap" some years ago. It's that latter swap that intrigues, for it's something of an unwritten rule that one does not initiate "wet operations" against people one has traded in a spy swap. After all, who would swap spies when the practice was simply to kill them later anyway? The bottom line: if Russia wanted Skripal dead, they had ample opportunity to do so when he was in their custody. Don't get me wrong; virtually everyone in the "spy business" at some point conducts "wet operations" (to use the old KGB parlance for assassination of someone else's agents, spies, and so on). My problem with the Skripal case has been the usual one of means, motive, and opportunity: virtually everyone in the case has the means and opportunity to do him in, and most have the motive to do so (if recent revelations about his possible involvement in helping prepare the Trump dossier are true). 26.As Craig Murray has again pointed out, since its 2013 statement, the OPCW has worked (legally) with Iranian scientists who have successfully synthesised these chemical weapons. Was Mr Johnson aware that the category of “Novichok” chemical weapons had been synthesised elsewhere when he stated that this category of chemical weapons is “made only by Russia”? So, as the West's major governments have been involved in yet another round of the "Blame Russia and Putin" game, what these questions amount to are 1) there is no real evidence that Russia was involved that has of yet been forthcoming; 2) the investigation has been politicized from the outset; 3) any number of countries would appear to be capable of manufacturing the alleged nerve agent, (which, suspiciously, the British government did not warn locals about for a full week! ), from Iran to the USA, which dismantled the plant allegedly involved in making it! and 4) the connection of Skripal to the Steele-Trump dossier affair at least raises the possibility that other motivations are operative in the incident than Russia wanting to "take care of" a one-time mole and double agent, which it had previously already done in Skripal's prison time in Russia prior to his swap. If the latter is true, then what it implies is something so horrendous that it should give everyone pause, for in their willingness to ratchet up tensions with Russia yet again, the West appears to be trying to misdirect attention from aspects of the case that would suggest its own possible involvement. Sorry, Mrs. May(and everyone else), but ratcheting up tensions with Russia, serving ultimata and expelling diplomats, on the basis of such a flimsy case, are not the way to go. Answer the questions. Even Mr. Corbyn, crazy as he is, knows there is something wrong with the story. I am compelled to say how stunning and pleasurable it was, for me to read Dr Farrell’s back-handed compliment to Jeremy Corbyn. For many years I have been using “the metaphor”, albeit unknowingly. I can, quite easily, see the ‘common ground’ where Trump, Putin, Corbyn and Xi Jinping would have meaningful talk. The West has pushed duality to the limit; ‘the people’ need to get off their ’roundabouts’ [carousels] and make that clear. Enough really needs to be enough. There was a curious mention of VX nerve agent in an article published by The Guardian, Feb 24, 2017, [American edition] regarding the deadly attack on Kim Jong-nam, the half brother of North Korean dictator Kim Jong-un where The Guardian claimed the VX nerve agent that killed Jong-nam was developed in the UK in the 1950s during research into pesticides but it was found to be too toxic to be used safely. I am wondering now if the dastardly Soviet Ruskies stole those secrets from the dastardly Brits? It’s a mad, mad, mad, mad world, and complicated business to say the least! Speaking as a Britisher who detests all kinds of left-wingery, I was appalled to find that I was in agreement with Jeremy Corbyn (leader of our increasingly marxist Labour Party) when he suggested that we ought wait for proof before taking action against Russia. But he was shouted down, not only by his usual political opponents but, interestingly, also by many of his usual political allies. A political result of this would be to stop some high-profile spy swap involving Russia. Cui bono? It’s hard to see how this benefits Russia, considering this incident should only serve to justify continued or further economic sanctions against them. That’s not to say there isn’t some possible benefit–but it’s certainly hard to see at this stage. “What has astonished me personally is the nearly unanimous behavior of the Western powers.” Ditto. “My problem, from the start, has been the utter lack of real evidence that Russia would do this, and the utter lack of a motive for it to do so.” Yes–it sure looks that way. If there’s such compelling evidence, why not make it public? Questioning the official narrative of Western governments is not the same thing as saying you want to live under a Russian-type government. Indeed, the ability (if not the obligation) to question one’s own government is fundamental to Western concepts of a free society. Just to have to add a note of caution. Because, although people mean well, they don’t entirely understand some things. My partner was born in South Africa during apartheid. Not a “western country” like people reading this will be in. I agree with her now that people like us who live in western, “democratic” countries do NOT know what it is like to live in a country like South Africa. She is now looking at the situation in Russia (she, by the way, has read all the Russian stuff, she was a communist at one point), sees it to be rather like South Africa was 40 years ago ie an extremely politically dangerous place to be. (oh and my partner knows how it can be, she had her phones tapped at one point in South Africa … most people in the west don’t have that happen to them). So … a word of caution for those reading RT, Sputnik, Aletho News, The Saker etc … just because they put in some truth does not make them anything less than propaganda vehicles for the Russian government. Russia is not a fun place to live. Putin’s “enemies” have been KILLED. That is real. Putin is not out to help the western white man. He is in the style of an old Russian nationalist (although, he doesn’t really give a monkeys really about his people). He is not a benevolent dictator no matter how you paint him. So be careful with what you read. I tend to take EVERYTHING from the mainstream media in the west with a jaundiced eye. I also take EVERYTHING from the east or Russia fan-blog with a far more jaundiced eye. I don’t see that with people looking at, I have to say, dodgy looking websites like The Saker (run by a “Russian” guy in New Zealand I believe(?). So be careful in what you read. You may further down the road find that you have been backing very scary people. The US, UK etc are slowly on their way to being a police state as we know, but Russia is another kettle of fish. They in a lot of ways are there already. They have no democracy. ALL media that comes out of Russia is state sponsored. It is propaganda. The MSM in the west is not any way perfect, but it is not anything like the Russia stuff yet. Keep your eyes open. Some things are real. Some people are murdered on foreign soil. Some are not … it’s a murky world out there … but don’t disbelieve everything you hear or see. That way leads to madness, and you may end up praising people who should not get your praise: Putin, especially. The Saker lives in Florida, and is married to a US citizen. He raised his kids in the US. He is descended from a White Russian family who fled the country during the Bolshevik Revolution. His family has truly-hated the Soviet Union for generations. Thanks Goshawks for a deeper historical perspective. Here is the background material that was forwarded from the Foreign Office, manned by Boris Johnson, to the other nations that gave them the reason to expell Russian diplomats, including Norway, one diplomat. The pages tell the story for itselves. Haven`t we seen powerpoint evidences before. It is embarresing. It is looking like we have got a new Olga Marie. This video is dedicated to Theresa May. To make the discussion more balanced and interesting I will come with views that support the Russians involvement, about which I have less doubts. Skripal might have used some old connections in Russia to help Steele to provide evidences that Trump is hand in hand with the Russians, or was helped by Russians to win the elections, and that Russians having some incriminating evidence on him and are blackmail him and so on, whatever was already discussed. As the enquiry advance in US and maybe more info were released and Russians get some intel about, they decided to both eliminate a spy and make a point. Iirc a FSB general was found dead in his car at Moscow not long after Steele dossier was first revelead, so it seem they want to close all ties and leaks. Skripal daughter maybe was a sort of courrier, transmiting informations from someone from Russia? Another reason was that Russians maybe wanted to scare someone, they might have unknown double agents in their ranks and wanted to show them publicly that if they are discovered they will be in danger even if they manage to move outside the country. Another reason is that Russia, encouraged by the lack of a serious response after several assassinations on UK soil and more and more affected by the sanctions and some economy problems, wanted to test the waters with a more spectacular action. UK didn’t reacted much in the past, is an old rival, is in a difficult position with negociations with leaving EU and in US is president someone that might be at least partially controlled by Russians, blackmailed or otherwise. So Putin wanted to both humiliate UK at home by doing such stuffs on their soil and to test the solidarity and reactions of NATO and the relations betwen UK and US and UK and EU. If the response should have been weak and show a lack of unity, Russia would consider to push further with other actions. 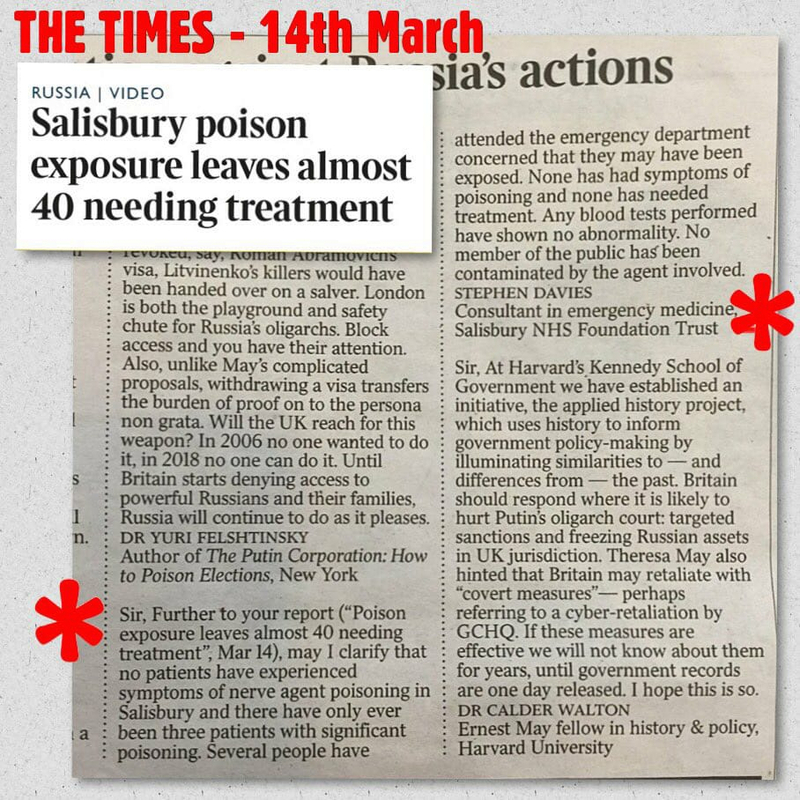 About why the nerve agent didn’t killed the Skripals right away, well, I suppose it depends on dossage and how was used (contact through skin, at touch, through air etc). Too much and they would have risked a larger contamination and more collateral victims that will provoke a bigger scandal. Too little and the victims might survive. It is unclear if they will ever make a full recovery anyway, and the intention might have been just that, cripple them permanently and make them suffer to make an example of them, for possible other double agents or so. I have less doubts of Russians doing this since their reactions were at first quite gleefully, that TV journalist from their official state TV was talking about what traitors deserve and so on right after the news about the attack first spread. Even Putin said something on this regard when changed Skripal and few others for some Russian spies arrested in west. The West’s lock-Step marching to the same tune shows that Intelligence is in charge[at least in part]. from food to news to evidence. Why not ask the West about how/why weapons grade anthrax that ended up in the two Senators against the PATRIOT ACT being passed? There’s a potential high-profile military grade weapon being used in a highly political theatre. It was later proven to originate at Ft. Detrick. That’s [The]De Trick question. that’s been crayon colored red. If Russia wanted to off Skripal they have more efficient weapon ryzin delivered via a piercing with an umbrella. This seems like a blood feud between Central European Scando-Germanic elites and Eastern Slavs with the rest of the World existence on the line as well. I wanted to point out something in another Saker article that caught my eye. All as punishment for Russia’s alleged nerve gas poisoning of a former Russian / MI6 double-agent, Sergei Skripal (66) and his daughter Yulia (33), who was visiting her father from Moscow. As Dr Farrell pointed out in his blog there has been ample time for anyone to “remove” Mr. Skirpal. So I find it odd and far more than a bit of coincidence that this attack occurs as his daughter is “visiting” him from Moscow. Not living with him, but “visiting”. So I wonder what Yulia knows or what information she may have been passing on and if she was perhaps the actual target. It’s complete and utter bs, anyone with half a brain, taking the most cursory glance, can divine that in a nanosecond. And it’s an embarrassment, too. Problem is, these nutjobs are shameless. According to the Abel Danger website, Northwest University (located in the Illinois Soviet Socialist Republic) were conducting tests involving said nerve agent. And if this is true, they would have to possess some of the substance in order to conduct such tests, wouldn’t they?